bi3 awarded a $3.2 million, three-year grant to a first-ever collaboration between Every Child Succeeds, Cincinnati Children’s and TriHealth to tackle infant mortality rates in Hamilton County – one of America’s highest. 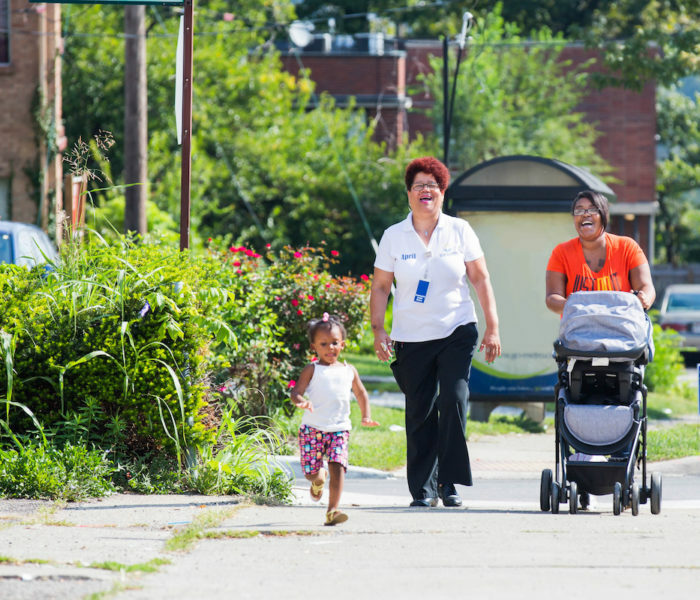 The resulting program, StartStrong, developed a unique mom-centered approach that proved effective in delivering strong outcomes in an Avondale pilot. Community health leaders credit StartStrong in decreasing the rate of extreme preterm births (less than 28 weeks gestation) from 1.79% to 0% and preterm births from 7 visits per 100 infants per month to 4.5, a more than 35% reduction. This corresponds with an infant mortality rate decline of 59%, with Avondale improving faster than any other urban neighborhood. The key was bi3’s ability to foster collaboration between competing healthcare providers. Community leaders, families and physicians were involved early in program development. In addition, disparate services were integrated into a single bundle of care – when before only single components were available. Importantly, the program’s success also was key in attracting more than $2 million from Ohio Medicaid to fund more community health workers to support pregnant mothers and their babies. To learn more about the StartStrong collaborative and its outcomes, view the report from bi3 or visit the StartStrong online toolkit for implementing the program in your community.